The toolkit includes both qualitative and quantitative monitoring methods for coastal habitats and resources, and demonstrates effective participatory development through a series of community workshops with local environmental leaders. 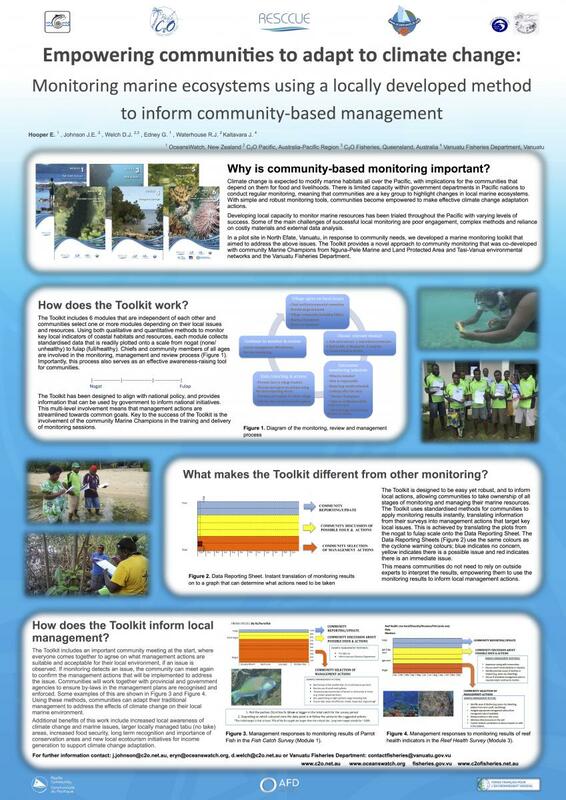 The toolkit includes a standardised process for communities to use monitoring results instantly, translating information from their surveys into management actions that target key areas of concern. Using these methods, communities are able to adapt their traditional management to address the immediate and medium-term effects of climate change on their local marine environment. The observed additional benefits of this work include increased local action through community-led environmental awareness days, increases in the size of locally managed no take areas and new local ecotourism initiatives to generate revenue to support climate change adaptation activities.